Oh my goodness, look at this adorable family! 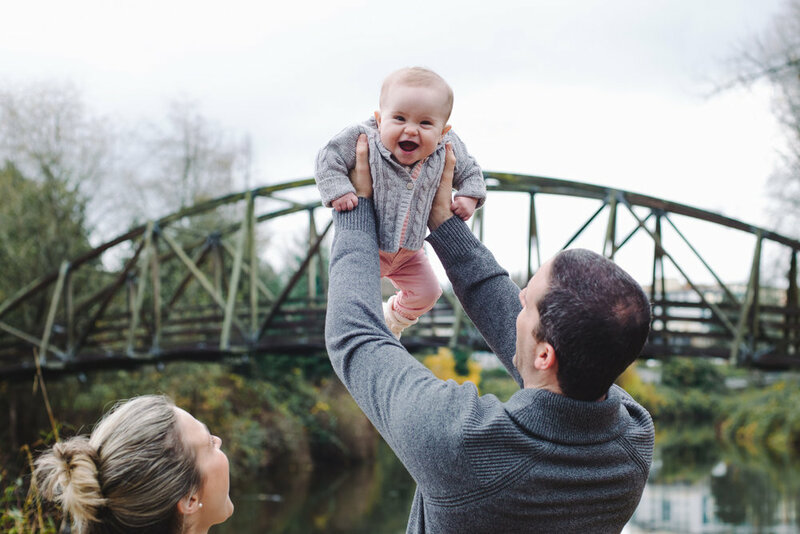 During their mini session along the Sammamish River Trail it was so evident that baby E is well loved by her parents. There was an ease in their movements and joy in their eyes. Even a small spit up was greeted with laughter and "well, we knew that would happen!" Thanks for sharing this cutie with me. When I first met with Lauren and Kate, they stated that they were having bright, bold, and fun wedding. They wanted a giant party for their friends and family and they totally nailed it. Their wedding is one that I play back in my head - the happiness that constantly radiated from them; the laughter as Kate took Lauren's last name by surprise; the quiet moments by the water where they forgot that we were there and just soaked in the setting sun together. I'm beyond thrilled that their wedding is featured in Seattle Bride's Fall / Winter 2017 Issue!